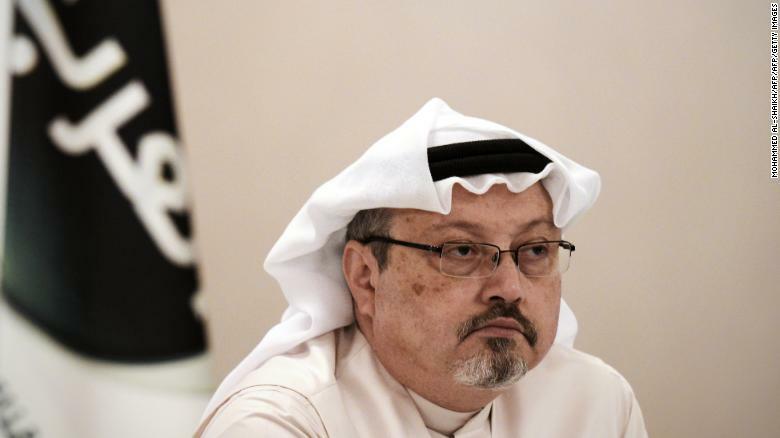 Washington D.C. (CNN Business) Jamal Khashoggi was murdered more than four months ago, but his memory is still very much alive among press freedom advocates. On Thursday representatives from the Committee to Protect Journalists, Human Rights Watch and other groups gathered near the White House to call attention to a looming deadline related to the Khashoggi case. Senators triggered the Magnitsky Act back in October, one week after Khashoggi&apos;s killing and dismemberment at the hands of Saudi operatives sparked global outrage. Friday is the deadline for the White House to respond. The act is used to promote human rights. It requires the president to determine whether a foreign person -- in this case Saudi Crown Prince Mohammed bin Salman -- is responsible for a gross violation of human rights "against an individual exercising freedom of expression." The CIA concluded that bin Salman ordered Khashoggi&apos;s murder, but President Trump and some of his allies have cast doubt on the intelligence assessment. Trump has emphasized the importance of the U.S.-Saudi alliance, oftentimes exaggerating the financial benefits of Saudi investments. The Magnitsky Act gives a president four months to respond to a letter from the Senate. "We request that your determination specifically address whether Crown Prince Mohamed bin Salman is responsible for Mr. Khashoggi&apos;s murder. We expect to receive your determination within 120 days of our original request," Senators Bob Corker and Bob Menendez wrote in a letter addressed to the President that was dated November 20, 2018. The original request was sent to the President on October 10. With Friday&apos;s deadline looming, a source familiar with the administration&apos;s plans tells CNN&apos;s Michelle Kosinski that the administration is expected to "double down on defending MbS. They think the pressure is fading." The source said the expectation is the White House will reiterate there is not a smoking gun. Some lawmakers and press freedom advocates are concerned that the White House will blow off Friday&apos;s deadline. That&apos;s one of the reasons why they gathered at Lafayette Park across the street from the White House on Thursday morning. Thomas O. Melia, Washington director at PEN America, said the "campaign for Justice for Jamal" matters to a wide array of writers, journalists and others who cherish free expression. "The most chilling message sent by the murder of Jamal Khashoggi is that no one is safe from Saudi Arabia&apos;s brutal reach," Courtney Radsch of the Committee to Protect Journalists said. "But this need not be true. A strong response from the US government and from President Trump himself and other governments would send a message to the Saudi authorities that acts, such as the murder of Jamal Khashoggi, will not be tolerated." She said the organizations hope that the White House does comply with the Magnitsky Act by providing a "full and final report," but "if they don&apos;t, we are not ending this fight." Senator Corker retired at the end of the congressional term, but Menendez and six other lawmakers moved on Thursday to introduce the "Saudi Arabia Accountability and Yemen Act of 2019," which would impose additional sanctions on Saudi. Last year&apos;s bill received bipartisan support, and this year&apos;s iteration already has as well, with Republican senators Lindsey Graham and Todd Young signing on. In a statement to CNN on Thursday, Menendez indicated that he has little confidence in the White House&apos;s response. "Seeing as the Trump Administration has no intention of insisting on full accountability for Mr. Khashoggi&apos;s murderers, it is time for Congress to step in and impose real consequences to fundamentally reexamine our relationship with the Kingdom of Saudi Arabia and with the Saudi-led coalition in Yemen," Menendez said.